Snorkeling and Diving are the most rewarding experiences that this marine natural wonder offers to visitors. 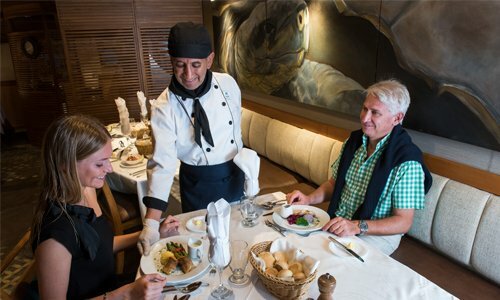 When visiting the Galapagos in one of our cruises, we are committed to fulfill this life changing experience by offering these activities in every tour. We highly encourage you to enter the living aquarium of the Galapagos Islands. Despite being located through the Equatorial line, cold ocean currents coming from the south pole and the west, bath the Galapagos creating very different environmental conditions to the rest of the globe that make this archipelago, a unique place in the world. The ocean is the most dynamic bio diverse self-contained ecosystem in the world. Life had its origin in the vast element and it is the reason for all living beings. All the wonder and magic of nature portrayed by shapes, forms and colors are fully displayed underwater. The Galapagos marine ecosystems portray all the beauty and accuracy with which nature shaped life. Marine life of the Galapagos is even more outstanding than what is to be found on land. Most divers consider the Galapagos Islands, the best dive experience of their careers.